The Lookout is a modern, luxury self-catering house located on the scenic peninsula of Waternish, Isle of Skye. From its elevated position over the historic fishing village of Stein, The Lookout offers majestic panoramic sea views over Lochbay, Loch Dunvegan and across the Minch to the Outer Hebrides. The purpose-built, eco-friendly construction was designed by local architects at Rural Design to be a comfortable space to relax, whilst optimising the views. 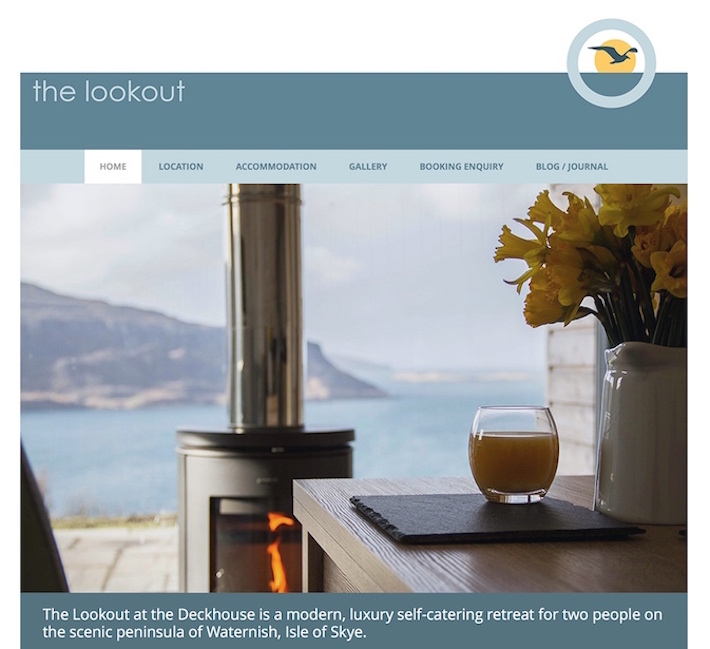 Skyewebsites were approached by the owners of The Lookout to develop branding and marketing for the accommodation which would capture the ideas of retreat, exploration and discovery. It was important that the connection between the interior of the building and its scenic, rural location was represented in the logo design and photography. We worked with the client to create a logo which depicts the silhouette of a bird in front of a sunset, through a telescope. The branding is subtly emphasised through the photography which captures the sense of being on the inside and looking out. As part of a tailored marketing package, Skyewebsites were responsible for the various creative aspects of the project including logo design, photography, business cards and the design and development of a mobile responsive website using the WordPress content management system.